All students, faculty, staff, and guests must check in at the RCC and UFCU Alumni Gym for recreation use, home athletic games and/or academic courses. Bring your SEU ID card and present to staff at either facility for access. Looking to be active? Live, run, swim and sweat with us. 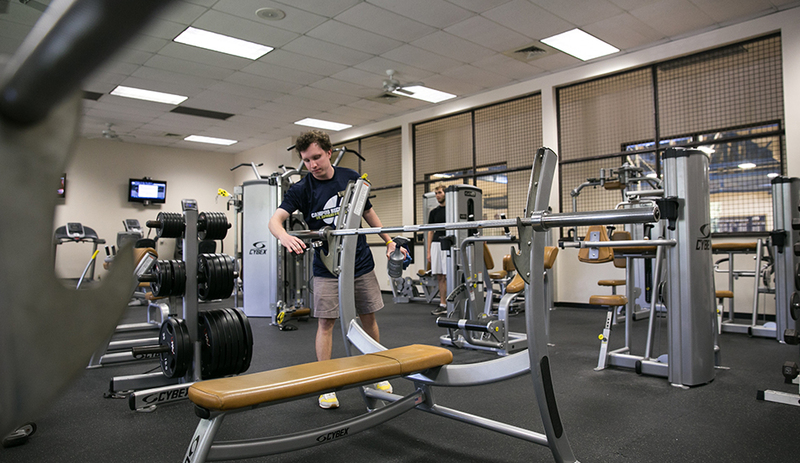 Recreation and Wellness provides cardio equipment, strength training facilities, basketball courts, racquetball courts and a pool to ensure there’s always a way to be active on campus. The RCC's fitness center completed a renovation in July 2012. The center features CYBEX strength training equipment and Precor cardio equipment. New to weight training? Recreation and Wellness staff can help get you started with a weight room orientation. The facility also has four racquetball courts, two basketball courts, volleyball courts, changing rooms, and study and lounge space. Equipment is available for checkout with a valid SEU ID. The RCC pool was renovated in Summer 2009, and included a new plaster pool bottom, new tile and repainting of the natatorium. The pool has six lanes and is 25 meters long. The UFCU Alumni Gym was renovated in Fall 2014. Housing one full basketball court, two volleyball courts, a fitness studio and the Recreation and Wellness administration offices, the Alumni Gym serves as a hub for recreational activity. The Alumni Gym hosts most GroupX classes, Club Sport practices and meetings, Intramural Sports contests and open recreation opportunities for students. The Practice Soccer Field is available (when possible) for Intramural Sports events, Club Sports practices and games, and special events upon request. Open recreation is not permitted on the field. Opened in Fall 2010, the Recreation Field is available at all times for Club Sports, open recreation, intramural sports and special events. You can find rugby, lacrosse, ultimate frisbee, soccer, flag football or even boot camps on the Recreation Field. The outdoor track circles the Lewis-Chen Family Field and is available for walking and jogging. The track measures at just over 1/4 mile in length. To ensure the appropriate use of space, Athletics and recreation programming needs are prioritized. When available, university departments, individuals and student organizations may rent various facilities. A fee is associated with rentals to cover overhead costs and to ensure the security of the facility. Rates will vary based on programs.